I must apologize for yet another extended absence (more than 2 months without any posts here) as my life continues to undergo major changes. It's been nearly six months since I met my girlfriend (under highly serendipitous circumstances) and things continue to grow more exciting as we get to know each other more. I also recently gave in and decided to convert from part-time to full-time work after almost 3 years of working about 20 hours per week, during which time I was content to be just barely making it financially. I was juggling two different part-time jobs for a while with the workload inching ever closer toward full-time so it finally made sense to ditch the sillyness of having two part-time positions and stick with one full-time job. The transition has gone pretty smoothly thus far but it will definitely be a challenge to keep up with all the reading and writing I plan to do while staying physically and socially active with half of my week's waking hours devoted to an office job. I'm taking solace and inspiration in the fact that there are writers out there who not only have full-time jobs and write prolifically on the side but who also have families to take care of, too. For now, I've got just one mouth to feed and should have plenty of mental energy to devote to my intellectual pursuits each week. On that note, another reason for the slim presence on my two blogs lately is that I've spent an absurd amount of time working on one very large piece. 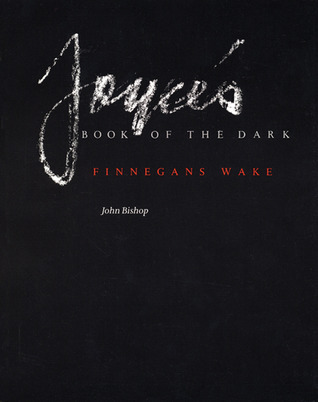 I've wanted to write a very thorough summary review of Joyce's Book of the Dark by John Bishop for many years now because it is without a doubt the largest and most enlightening study of Finnegans Wake there is and I've always been disappointed at how little discussion there is about it on the internet. Bishop's book unpacks so many interesting ideas in such a thorough manner, you'd have thought someplace out in the far reaches of the interweb universe there'd be some intensive talk about it. But I haven't found much at all. Even the book's Amazon page only has 6 reviews, one of them a misguided and confused 1-star. It was actually from Bishop's book that I got the title for my blog devoted to Finnegans Wake (pg. 169: "Finnegans, wake!, you have nothing to lose but your chains"), highlighting the imperative angle of Joyce's title, urging all the sleeping Finnegans to wake up! and take off their shackles of mental and spiritual slumber. A main part of my intention with starting that blog was to write reviews for the many fascinating studies of the Wake that are out there and certainly none come close to matching the originality and depth of Bishop's book. So as soon as I finished up with reading the Wake last December, I jumped right into Bishop's book for the first time and devoured it within a few weeks. Then I started composing a review and realized... I needed to read it again. This second reading took many months as I was thoroughly parsing this heavy scholarly (yet entertaining and readable) text to take notes and distill its vastness into a sharp summary. In the meantime, I'll be chipping away at the remainder of the review and trying to build up some writing momentum so as to keep both blogs alive and healthy throughout 2014. Glad to see you up and running again, PQ. I thought life had probably taken another twist and turn or two, but am glad you are getting the blogs revving up as well. I actually decided to get a copy of the Bishop book and it just arrived yesterday, so that's a nice coincidence. I saw your post on it, but decided to wait to read it until I'd made at least a little headway on my own. We SC Wakers meet tomorrow after a brief hiatus due to holiday scheduling, so it seems a good time to rededicate myself to all things Joyce. I'm glad things are going well for you. Happy New Year.